You are here: Home / Indie / Music Friday Live! / Show Review / Amanda Abizaid smoothly shifts to gentle jazz Upstairs at Vitello’s. Amanda Abizaid smoothly shifts to gentle jazz Upstairs at Vitello’s. Reviewed by Patrick O’Heffernan on March 27, 2019 . 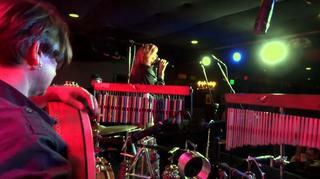 (Studio City, CA) I have seen Amanda Abizaid live twice, once at the Irish-themed rock club Molly Malone’s in the Fairfax district of LA and last week at Upstairs at Vitello’s jazz club in Studio City, a celebrity enclave just over the hill from Hollywood. Same songs, same orchestration, but different feels – both very entertaining. Abizaid is a tall, honey blond, green-eyed singer/songwriter originally from Lebanon but ensconced in LA for years. She was backed at Upstairs at Vitello’s by a new band working with her for the evening that was down-to earth and rock solid. As with all of her music it included Middle Eastern instruments like the saz (long-necked mandolin), and hand and frame drums. There was also a percussion rack with a collection of hanging metal devices whose names I do not know but whose sounds work really well. Born in Beirut, Lebanon, to an American mother and a Mexican/Lebanese father, she traveled the Middle East and Europe with her family until she was ten years old when she moved to the United States. She absorbed music from her Middle East origins, but she also listened to late 70s artists like Alice Cooper, Elton John, Crosby, Stills and Nash, and The Beatles. Along the way she studied drama, music, and hair-styling and was a top runway model for names like Oscar de la Renta . Her musical talent blossomed in LA with backup vocals for TV shows and then she hit it big with her soundtrack recording for The 4400. She launched her professional live music career at Molly Malone’s and now has four albums out plus a brace of EP’s, remixes, songs on collections and the soundtrack from The 4400. As much as I enjoy listening to her songs in my headphones or earbuds, it is the live performances that are most exciting. She sings with two microphones, one for the standard house sound system and one that adds echo to her voice. Combined with the Middle Eastern rhythms and instruments, plus occasional lyrics in Arabic, the effect is enthralling. When I first heard her rocking out at Molly Malone’s with a beer in my hand I was in blues heaven. So I was curious as what an Amanda Abizaid concert would be like in a top-scale jazz club while the audience dined on five-star Italian food and (in my case) sipped Champagne. The answer is very, very entertaining. Her jazz night was as much fun as her rock/blues night (but northern Italian rack of lamb beats Molly’s burgers and fries any time). It was a full night; 16 songs, all delivered with 110% energy and heart, but subdued and smoothly melodic. Swaying on stage with her signature smile, Amanda opened the evening with “Release Me” from her latest album Walking in Twos, using her throaty Middle Eastern voice and her silver flute to set an ethereal tone. She then moved to “How Much We’re Alike” and then the flowing 2005 release “Lebanon”. A trio of love songs followed: the 2016 single “One Love” delivered with a jazzy bossa nova tempo, “I Remember Her Love” delivered with a grin, and “Promises of Love”. She punctuated the love songs with “All things Small” from the 2015 Someday Girl, vol. II album. After a break, she returned to the stage and launched into “Warrior” and then onto my favorite, “Kings and Prophets”. Staying in the slower more restrained vein she gave us “Li Beirut”, “My Friend”, the Arabic “Iza Akdar “ and “Wash Me” from her 2010 album This Life. All of this set us up for the finale, “Lion’s Den” and her famous “Walking in Twos’ delivered from the stage as an anthem to cheers. Abizaid is stand- out talent in a city of stand-out talents. I realized that when I first heard her recorded music and was doubly convinced when I saw her live at Molly Malone’s. It did not occur to me that the full-tilt Middle Eastern-tinged blues rock I loved so much on Molly’s stage would map so well into swaying jazz. Even more remarkable was that she did it with so little change – the adjustments were subtle, but the effect was profound. And the fact that she did it with a new band – Herman Matthews on drums, Michael Mennell on bass, Dimitris Mahlis on oud and saz and guitars, Petri Korpela on percussion, Luke Miller on keyboards, and backup singer Sharon Vaturi – that she brought together for that performance is a testament to her skill at music leadership as well as music creation. Alt rock next? She probably could do it.